What is Down Syndrome? What causes Down Syndrome? Actually, there is a nucleus in every cell of the human body, in which the genetic material is stored. These genes are what carry the codes that make up all of our inherited traits and are grouped with chromosomes. And its structures are rod-shaped in appearance The nucleus of each cell usually holds twenty-three pairs of chromosomes, half from each parent. Down syndrome happens when someone has a full or partial extra copy of chromosome 21. There is no way to stop this from happening or cure this condition, but equipped with more information can help you deal with it. Around 25% of the time, you will find that trisomy 21 causes Down Syndrome. This means that the child has three copies of chromosome 21 (instead of the normal two) in each of their cells. This happens when abnormal cell division occurs during the development of the egg cell or sperm cell. This is a rare type of Down Syndrome, where children have some cells that have an extra copy of chromosome 21. The mixture of abnormal and normal cells happens because of cell division after fertilization. When part of chromosome 21 becomes translocated, or attached to another chromosome at or before conception, Down Syndrome occurs. Children with this syndrome will have the normal two copies of chromosome 21, however they also have material which is additional from chromosome 21 attached to the chromosome that is translocated. Without knowing the risk factors, we can't get a full picture of what causes Down Syndrome. As a woman gets older, her chances of having a child with Down Syndrome increases since the older eggs have a higher risk of improper chromosome division. 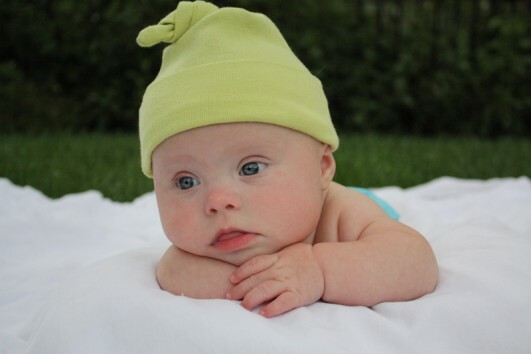 By the age of 25, the chance of a woman conceiving a baby with Down Syndrome is about 1 in 350. By the time she is forty, the risk is 1 in 100 and by the age of 45 the risk id 1 in 30. Most children with Down Syndrome however are born to women who are less than 35 since younger women have a lot more babies. Generally, when a woman already has a child with Down Syndrome, her chance in having another child with the same condition is about 1 in 100. Down Syndrome is not inherited most of the time. Instead it is caused by a mistake in cell division when the sperm, embryo or egg develops. Translocation Down Syndrome is the only kind which can be passed along from parent to their child. Only around 4% of kids with Down Syndrome, however have translocation and only about a third of these got it from their parents. In the case that translocations are inherited, the father or mother have some genetic material which is rearranged, but nothing extra, therefore they are a balanced carrier. These types of carriers have no signs of Down Syndrome, however they can pass the translocation to children. The chance of this happening depends on which parent is carrying the rearranged chromosome. The risk is around 3% if it is the father, and between 10%-15% if it is the mother who is the carrier. Prenatal tests and screenings can estimate the chances of your fetus having Down Syndrome. However these tests do not tell you for sure if the baby does have the condition, just a probability. On the other hand, a diagnostic test can give you a diagnosis with almost100% accuracy. Blood tests and an ultrasound evaluation can be used at this time to check for Down Syndrome. These tests are performed somewhere between the tenth and fourteenth week of pregnancy. Ultrasounds can check the back of the baby’s neck. If there are any developmental problems, there will be additional fluid collected in the area. Blood tests check the level of plasma protein-A and HCG or human chorionic gonadotropin. High levels of these indicate a problem with development. There is a higher rate of false positives than with other tests that are done later on in pregnancy. If the results are abnormal, your doctor might also do an amniocentesis, in which a sample of the amniotic fluid is used to confirm results. You’ll be at a high risk of birth defects if any of these tests results do not come out normal. CVS or chorionic villus sampling: Cells are taken from your placenta to look at the fetal chromosomes. It’s done during the ninth and fourteenth week of pregnancy with a miscarriage risk of 1 in 100. Amniocentesis: A sampling of amniotic fluid is taken and examined to determine the number of chromosomes your baby has. It is done around 15 weeks and has a 1 in 200 risk of miscarriage. PUBS or percutaneous umbilical blood sampling: Blood is taken from the umbilical cord and looked at for chromosomal defects. It’s done after the18th week and carries an even higher rate of miscarriage, so it is done only if the other tests aren’t certain. Some women opt out of these tests due to the risk of miscarriage and would rather risk their child having Down Syndrome instead of having no child at all. There are over fifty features of Down Syndrome, however not everyone with this condition has all the same features or problems with their health. Some problems and features are more common. Hypotonia or weak muscles throughout the body. The stomach sticks out due to weak muscles in the belly. Short in height. A child grows slowing and will be a shorter than average adult. Wide, short neck. The neck might have extra skin and fat. Stocky, short legs and arms. Some children could have a wide space as well between their first and second toes. Eyes that are slanted. There might also be a buildup of tissue on the iris; however the vision of the child won’t be affected. Appearance of a pushed nasal bridge. The flat area between the eyes and nose is the nasal bridge. Smaller ears. They might also be set lower on the head. A mouth and tongue that are irregularly shaped. They tongue might stick out partially and the palate be high and narrow with a curve downward. Crooked and irregular teeth. Teeth many times come in late and in a different order than other children’s teeth. Heart defects. Around half of children with Down Syndrome have a heart defect at birth. Intellectual disability. A majority of Down Syndrome children have a mild to moderate level of cognitive disability. Depression or behavioral problems was linked to autism or ADHD. Hearing problems, respiratory infections or dental problems. For Down Syndrome there is no cure, but parents can use early intervention to promote the learning skills of their child and go to support groups to help them cope with this difficult situation. Seek out information from your doctor about early intervention programs near you. Most states have them available, and these special programs give children with Down Syndrome stimulation at a young age with the right motor, sensory and cognitive activities. Programs will vary, but generally involve special educators and therapists who will help your baby develop language, motor skills, self-help skills and social skills. You will have to make important decisions about the treatment and education of your child. Get a team of teachers, health care providers and therapists which you trust. These professionals will help look at resources in your area and break down federal and state programs for children who have a disability. In most cases, communities will have support groups for anyone with a Down Syndrome child. You can also use the Internet to find support groups. Friends and family can be a source for support and understanding as well. A majority of Down Syndrome patients live independently or with their families, go to regular schools, have jobs, read and write. They can still lead very fulfilling lives despite their disabilities.